Fontcuberta begins his essay Archive Noises (p.169) with a pair of dialectically opposed terms – documentation + experimentation; memory + forgetting – which can be traced back to the original 1839 presentation of the daguerrotype to the French academies of the arts and the sciences. Fontcuberta’s essay will mainly be concerned with the second of these – memory + forgetting – but almost immediately points the reader back to an earlier section of the book – Documentary Fictions (pp.104-111) – and the quote from Ann Tronche which opens it – ‘what defines our most recent modernity is often an image which declares itself to be an image of an image‘ (pp.105-6) – and which he then repeats here (p.170); the quote is seen by Fontcuberta as ‘prioritising the archive as a place of experience.‘ And of course, this is what we’re looking at in this section of the module. JF begins by examining the idea that ‘the archive’ is one of the mechanisms used by society to structure history and so control our relationship with both the collective past and the way that this determines the present and our future. The remainder of the essay looks at the ways in which artists such as Joachim Schmid make attempts to loosen the history’s stays, working with the contents of impromptu archives made up of vernacular photographs discovered on the street and in junk shops. To do this JF goes on to look at two, early bodies of work by Schmid, both of which address what can be done with the great unexploited backlog of photographs that was out there at the turn of the century. Masterworks of Photographic Art addresses the growing academicisation involved in creating a photographic canon. Statiks break up pictures with the same subject into strips which are then combined to create something much more abstract. Marking the 150th anniversary of photography, Schmid (and Fricke) put together a series of 20 anonymous pictures which could have been previously unknown pictures by ‘the masters of photographic art’. The ‘August Sander’ – Middle-Class Twins. 1924 (1989) – reproduced along with much discussion of Schmid’s earlier work, in Fontcuberta (181) is uncanny. I’d have been fooled, anyway. Other photographers impersonated included canonical favourites such as Eugene Atget, Cindy Sherman, Robert Frank Harry Callahan and David Hockney. Just brilliant! This ties in well with Abigail Solomon-Godeau’s essay Canon Fodder – Authoring Eugène Atget (contained in 1991) and its deconstruction of the way Atget had been variously coopted by successive discourses and movements – surrealism, Berenice Abbott, Walter Benjamin, modernist criticism, MoMa and John Szarkowski, ideas around the construction of ‘authorship’ etc – and has become central to the creation of a critical and market concensus on who are the ‘great photographers’. This was the text for discussion in the Photography Reading Group a month ago. The second series discussed in depth –Statics – is harder to characterise. It involves the destruction of typical photographs – sunsets, say – or printed material – such as billboard adverts or flyers – and then arranging the destroyed strips into something that resembles a de-tuned TV screen or possibly an abstract expressionist painting. Rather marvellously, one of the sources is a copy of Walter Benjamin’s The Work of Art in the Age of Mechanical Reproduction. The resulting pictures are rather beautiful (and also have been used by Schmid as invitation cards for exhibitions of his other work. Schmid’s series discussed in the essay are earlier than those examined in the following course book research point references. They will be subject of my next post and I will look at the third series discussed by JF – Archiv – there. But finally, this quote from early in the essay (p.170) sent me back to my own archive to find some photos I took in August 2007 at the park in Kiev that contains the Babyn Yar holocaust site. It was a lovely summer’s afternoon, and families were playing on the grass, sitting in the shade of the trees and walking hand-in-hand along the paths. It all seemed peaceful and happy – a long way away from the horror of 1941. No one was paying much attention to the various memorials to the different groups of victims. I took a series of pictures of a mother with a baby and an older daughter with the Jewish memorial’s huge minorah visible in the background. what is the status of this image? I have bought myself a new toy – a Fuji Instax printer. I was given some money by Fiona’s parents for my birthday, and – having noticed Fuji’s instant film printers in the Photographers’ Gallery shop, found it (as ever) much cheaper on Amazon. The stock is much cheaper online too. Anyway, the printer arrived yesterday. I downloaded the control app onto my phone and put the battery on to charge overnight. This morning, I ran through the photographs on my phone and found this one from the trips that provided the raw material for Assignment 1. It was taken while I waited in a bar round the corner for a table to become free in the restaurant I’d chosen to eat in. I loaded the pack of instant film into the printer and connected to it with wireless. I applied the app’s ‘optimise’ filter to the picture and sent it to the printer. Pretty much immediately, the print emerged with a whine, just like Polaroids used to. Over the next couple of minutes, the picture faded in (again, just like polaroids used to) and I wrote a simple caption on the white border. When the ink had dried – don’t want inky smudges on the scanner glass – I scanned it and then lost the background to the resulting .tiff in photoshop. I saved it as a jpeg and then I posted it here. The ‘original’ is now blu-tacked onto the wall by my desk as I type this. This is scary and useful in equal measures. It is also information which vanishes as the file is rendered into whatever happens to it in the printer. It is almost as if the metadata provides the missing third-dimension to the onscreen image, and that this is replaced by a physical third dimension as the printer turns the file into an object while stripping the extraneous metadata. I’ll characterise this object as a digital instant-type print, in the same way that a digital c-type print is what you get from Boots or Snappy Snaps when they either take your file (as I have done here) or scan your film negative and make a digital file that way, and use it to drive a photographic printing machine. Of course, unlike traditional instant prints that have been made using a camera, this print is not necessarily a unique object: the printer stores the file that has been sent from your phone and has a ‘reprint’ button that allows you to make further, identical copies. The indexical link between the subject and the resulting print has been well and truly broken. But enough of this ontological musing! I got the printer because I thought it would be a good way of generating artefacts from my travels, that could form parts of assemblies like the ones I made for part one of the first assignment, extending the scope of the travelogue-type images considerably while freeing myself from the need to have a traditional camera with me at all times. For a long time now, I’ve been aware that I – like loads of other people – have been moving backwards and forwards between the new and the old technologies. Author Simon ChirgwinPosted on April 20, 2019 April 20, 2019 Categories Notes, Research & Reflection1 Comment on what is the status of this image? I rather like the six pictures I eventually got round to submitting for this assignment, although I’d be the first to admit that they all tend towards the more pictorialist (or possibly graphic design-ey) end of the spectrum. They display a variety of ways you can do things with montage or collage, and draw on a number of other people’s models. I am pleased with the way I managed to identify types of picture/subject matter that would go together well early enough while I was travelling and then put in the work to keep at the ones that required regular repetition, such as the tower pictures from Stockholm. Some of them were conceived at the time – the airport departures picture is the best example of this – while others were fitted together while I was reviewing pictures in Lightroom (or scanning tickets for my expenses) – the airport express picture was conceived that way, when common elements of form and the unifying yellow of the component pictures’ colour palette leapt out at me. The resulting compositions are satisfying and contain enough narrative elements to make looking at them seem worthwhile. The pictures hold together in terms of subject matter – drawn from a couple of work trips, and forming a coherent whole describing my experience of two places I had never been to before – and my treatment of them as a series of short stories, occurring within a specific time box. Throughout December, I felt I was refining the pictures I took as I moved first through Brussel, went on to Stuttgart and then visited Stockholm. By the time of the Swedish trip, I think I had worked out the pictures I needed to take to produce the finished combinations while not letting it simply become formulaic. Putting the assembled pictures together, I felt I was getting more on top of both photoshop (the three digitally compiled images) and of making flatly lit reproductions of the the proper collages. The act of assembling things physically with glue and scissors was also fun, something that can easily get lost in being ‘serious’ about making pictures (or ‘art’ even). I’m intrigued by the way the physical assemblies seem less finished somehow than the compositions put together in Photoshop. The danger of course is the infinite reviseability of it all, with undo always being an option. All three of the part two images feel very ‘dimensions vary’ and capable of being played with further. Indeed the blog version of collage two is a step further on from the version I had printed and sent on to my tutor. The much-larger-than-screen-size print of the final Airport Departures tableau also revealed some inexactness down the right-hand edge and some rogue reflections of figures who were no longer there in the glass at the rear. I will revise the composite file and have a new print made before it all is sent off for assessment. I think I have come some way towards finding ways to use ‘everyday’ photographs to tell stories and to illustrate aspects of my travels. I hope I shall carry on making more pictures like this over the course of the module. I think there are other things that can be pushed further – the postcard idea that comes out of two journeys to and from work – stockholm is definitely one to pursue, and the Airport Express compilation would work with other journeys as well. The final tableau was also satisfying to put together (both at the time I was taking the pictures, waiting for elements I might need to happen and also later when I was putting them all together). There are many possibilities opened up from scanning objects (and not just tickets and receipts and other 2-D things). I feel I have made a start here, but there is still a lot to be done going forward. I still haven’t managed to strike the right balance between over- and under- writing posts for my blog. My main issue is the amount of time I can spend in front of a screen typing without actually completing something that can be published. This is something I need to address going forward, if I am to have any hope of finishing the module before the two-year deadline is up. That said, what is here, on my learning log, is good but there could be more of it. I have completed all the exercises (although the final one – with a brexity theme – still needs to be polished and written up). I have read all the recommended texts a number of times each and think I understand what they are getting at. What I have not managed to do yet is to come up with a way of writing about theory without it simply reading as a paraphrase. I shall make an effort to catch up with this during part 2. I need to put more effort into writing up exhibitions and my thoughts about non-course artist’s work. I have been more successful at interacting with my fellow students -on OCA Discuss, and by taking part in course-related hangouts. I have found the feedback I have received on some of the course-work very useful and enjoy the sense of connectedness with others that this provides. It is also useful to talk through the more theoretical aspects of the course. I had a day off during my stay in Stockholm and did some tourist stuff – seeing the Vasa in its museum and going to see what was on at Fotografiska. As I walked south to the Vasamuseet, I stopped to make a picture of the roofline that face the water. As ever, it proved really hard to get a picture without a car passing in either of the two possible directions. I managed to get one eventually, but not before I had a variety of pictures with a car moving one way or the other. Making the pictures for Assignment 1 threw up a much larger number of images than could be included in the eventual six-picture submission. December 2018 had been a busy one at work, involving trips to Brussels, Stuttgart and Stockholm. The six-pictures I sent to my tutor mainly came from the final, Stockholm trip but I had been consciously taking photographs that could be combined with one another on the two other trips. It would have been nice to make two pictures – one physical collage and one digital composite from each of the three trip – but the Brussels trip was short and did not throw up enough material while, in Stuttgart, I was only beginning to come up with the ideas I would do much better at consciously realising by the time I got to Sweden. A degree of serendipity (and its absence) was also involved in the material I ended up with when I sat down at my computer (and my work-bench), back in London. I have not included the Stockholm Collage variant here, as it is to be found in my WIP post. My original intention for these was to start making a body of work describing my travels, while making a different series of portraits for the assignment. The portrait idea didn’t work out, so I adapted the travel series for the assignment. I may revive the portraits – subject to the availability of the models – later in the course. This is a second ‘public transport’ digital composite, made up of both sides of a scanned, twenty-four hour Brussels tram ticket and a photograph taken on my trip from Midi to my hotel on the night of my arrival. I spent a fair amount of time playing around with the relative opacity of the component layers (the blue rectangle with the MIVB/STIB logo was accentuated against the magenta of the front of the ticket; the edge of ticket against the background was taken from the front of the ticket only) and with how the ticket blended with the actuality picture. I like the resulting image, and suspect it would look good as an A3 print, but – like fig.3, below – it would be another digital composite and one which would not fit with the Part 2’s narrative . 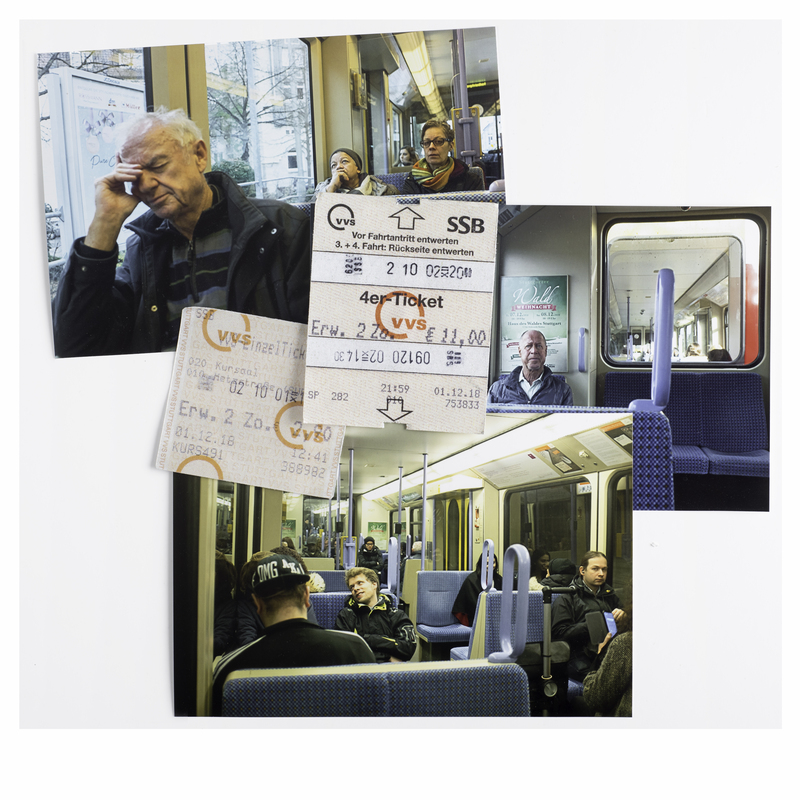 This is another example of playing with layers, masks and transparency; like the Stuttgart U-bahn collage it highlights an individual passenger. But it lacks the dynamism of the Airport Express picture and would have added a portrait-orientated image to a primarily landscape-formatted pictures. I did not complete many outtake physical pieces – the ones that didn’t work tended to reveal the fact early on – but this compilation of a photograph and both sides of a scanned receipt to record a meal is one that I still quite like. It only didn’t make the cut, because – being hungry – I had scoffed the food before I remembered to take a picture of it. My smoked sausage + sides from the submitted Stockholm meal collage can do it’s ‘things that look faces’ thing and adds a comic touch, but it breaks the frame I’d applied of only using component pictures, made in the same place or the same time-box for these pieces. Finally, these two pictures would have taken me over the six-picture limit for the assignment and were rejected in favour of later, better variations on similar themes. The Fernsehturm composite (fig.6) is made from two overlaid pictures of the tower (which were made at the start and end of one of the U-Bahn journeys that feature in A1-01) and one of an illuminated model of the tower that was part of the Christmas Market decorations in the town centre. It does not have any of the coherence provided by the context of the two TV tower pictures from Stockholm, but was a step on my way towards them. fig.7 is a composite of the pictures I took each morning and evening from my hotel window, focusing on the power station and its smoking chimney. While it captures some of the same sense of ‘accumulated time’ as the Stockholm composites used in the assignment, it has none of their sense of movement. For this reason (and because it did not fit with the connecting narrative of the Stockholm pictures) it was left out from the final selection. Produce […] a series of four to six landscape-based images based on your immediate surroundings […] Complete Parts 1 – traditional ‘cut and paste’ – and 2 – digital montage – of the assignment and upload the finished images to your learning log together with a short reflection on motivations, references and methods for both parts of the assignment. My immediate surroundings are rarely static as I travel a fair bit. Sometimes for work – in the UK and, less often, abroad – and sometimes to visit friends and relatives. As I go, I attract detritus. Ticket stubs and boarding passes get stuffed into my jacket pockets, sachets of sugar and beer mats, random things that seem to characterise wherever it is that I am, accumulate and are then emptied out when I get home. Travelling for work, I keep receipts so I can claim back my expenses on my return to London. I have travelled by train, tram, aeroplane and motor car, but wherever I find myself, I try to make some time just to wander around and explore. I keep my eyes open and try to get some idea of where I am, structuring my idea of the place around photographs I take with the camera that is always with me. For this section of the assignment – as well as the artists referenced in the course book – I drew heavily on my reading on Bauhaus tutor Albert Albers’ use of photographic collage to make three images reflecting some of the lived reality of my trips abroad. The three collages that make up this section are assembled from standard-sized C-prints made at high street labs, combined with scanned and re-printed artefacts, collected on my travels. They are mounted on foam-board. Re-photographed, the resulting images can be read as depictions of physical objects rather than flat, digital pictures. They are handmade, assembled from individual components. They have depth, indicated by shadows and edges, rather than being all surface. They are personal. Somewhere at the back of my mind there was an idea formed from reading of the newspapers, blog entries and self-published pamphlets (such as the LBM Despatch) made by Alec Soth as accompaniments to more finished and fully formed bodies of work like Niagara or Sleeping by the Mississippi. In Stuttgart at the beginning of December, I travelled between my hotel, on the east side of the river and the centre, making occasional detours to places connected with my work. Later, I visited Stockholm. Between my hotel and the organisation I was visiting, there is an open area of rough ground where people cycle and walk their dogs on the paths criss-crossing it. To the east, the view is dominated by the Kaknästornet, the Stockholm Television Tower. As I walked to and fro past it, it became a familiar object. In Stockholm there was a restaurant I visited twice during my stay. The first time I was with people from work, but – liking the food – I returned later on my own. I’d intended to have Pytt i panna (the hash-like dish my colleague ate on my first visit) but on the recommendation of the waiter, I had a smoked sausage with mustard, beetroot and potato salad. Again, I have tried to suggest narratives through my combinations of photographs, but here the pictures, which have no prior existence outside the digital space, seem more finished and less obviously diaristic than the collages. They have compelled me to refine my use of photoshop, using masks and small adjustments to either hide or accentuate the joins between component pictures. The resulting images form parts of a common narrative, each depicting a stage of my journey home from Sweden. 15.00 CET, 12th December 2018. Walking back to my hostel to collect my luggage, the sun emerged for the first time during my visit. With time to spare, I left the path and walked towards the tower. As I walked, I enjoyed the warmth on my face and the fresh air. 17.00 CET, 12th December 2018. My luggage collected, I travelled into town and caught the airport express from Stockholm’s Centralstation. Twenty minutes later, I was at the check-in desk. 19.00 CET, 12th December 2018. Waiting to board my flight, I sat and had a beer, looking out the shifting patterns of my fellow-passengers in front of me. A girl walked past, as mystified by the scene as I. The first picture of the sequence is a container for a finite period of time spent at a specific location. This image stacks up the photographs I took at intervals as I walked, keeping the tower steady in the centre while my view of its surroundings changed. It becomes a container for the time I spent walking, a subjective memento recording time and space and my journey through it. I can see links to the walking art of Richard Long. If the first picture of the sequence represents a vector pushing forward into the picture, the second is all about movement from left to right (and the implied reverse). The arrow pointing back to Stockholm, owes much to the words ‘thats Switzerland that was‘ (sic) behind the speeding van in Hockney’s early non-figurative painting included in his huge retrospective at Tate Britain in 2017: Flight into Italy – Swiss landscape (1962). The movement in the third picture – a tableau, influenced more by Jeff Wall than by Gregory Crewdson – is circular, entirely contained by the frame. The girl with a suitcase crossing the foreground, provides the viewer with someone to identify while the eyeline of the seated man on the left stops your eye following the girl’s ‘look’ out of the frame, bouncing you back into the composition. It’s left to you to work out who these travellers are and what precisely is going on. I have submitted six A3, C-type prints to my tutor. All three collages are enlarged by this, while the three digital pieces have simply had their dimensions set. All three digital pictures benefit from being viewed larger than they can be on screen; as files, none of the three digital pictures had seemed quite resolved. The collages would probably be better viewed in their original form; as physical objects, they have more presence – aura even – somehow. Tweaks can still be made to all the pictures – the red border round the central prints in fig.2 for example is not present on either the original or the re-photographed version – and different – even larger! – prints could be made. Small errors – there is a reflection in the background of fig.6 for example – can be corrected. And they will, before assessment. (NB – With the exception of fig.9 – stockholm: 20 minutes to the airport – which went together too straightforwardly to generate any real variation during its making – none of the pictures included in this post are the final versions used for the assignment. All three of these travel-themed collages were made from small, standard C-type prints made at Boots on glossy paper (figs. 2, 3 & 4) or Snappy Snaps on matte paper (figs. 5 & 6). The prints that make up fig.2 used Boots’ miniprint option, which produces The receipts and tickets that are incorporated into figs. 2, 5 & 6 were scanned and then printed on normal (ie non-photographic) A4 paper. The map that forms the background to fig.3 is a screen grab from google maps and was also printed on A4 paper. The receipts and tickets were then cut out with a craft-knife and had their edges roughened; finally, they were flexed or folded a bit so they looked more like the original artefacts I had brought home from my travels. I also made prints at different sizes, trying to scale them to fit with one another better (a lesson learnt from exercise 1.3). In the end, I found that life-size images of the receipts fitted in better with the 6×4 prints as they obscured less of the scenes they were associated with. The collages were assembled on foam board (used for architectural modelling) using PVA glue. Problems with the absorbency of the paper led to the wrinkling of the receipt, visible in fig.1; for fig.2, I used less glue, which also increased the 3D effect of the collages when they were rephotographed. The first of my three collaged pictures takes things I have brought back from my travels many times before – tickets for public transport and pictures taken while travelling. This trip was to Stuttgart at the beginning of December. The assembly of the various elements emphasises the regular geometry of the rectangles and verticals found on Stuttgart’s U-Bahn while the tickets locate you in space and in time. The main people in the pictures – the man resting his head on his hand, the slightly haunted looking man in the second picture, the young man on his way home from a night out – provide the sparks of narrative, while the people who have spotted me – the woman with glasses and the man at the far right of the night time picture – locate me, and by extension the spectator within what is going on. In Stockholm, I had booked a room in what turned out to be a very nice, comfortable youth hostel. My work in Sweden centred on the Swedish Radio building ten minutes’ walk away, across one of the stretches of open land that divides the city. As I walked between these two points in the morning and the evening, there were always people walking dogs or jogging and, in the background, the Stockholm television tower (the Kaknästornet). Midway down the path I walked was a signpost. 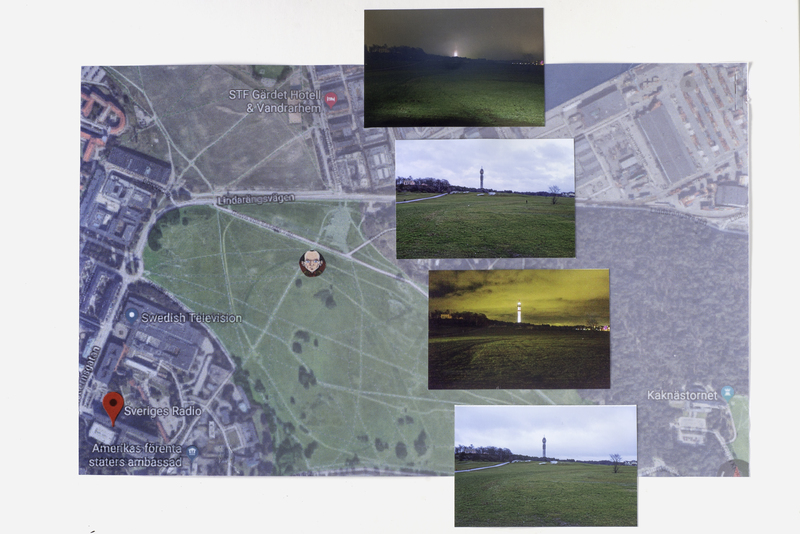 I stopped there and took a photograph with the tower centred in the viewfinder each time I walked across the open space over the course of my stay in Stockholm. If I had not taken the series of pictures that make up fig.7 on my last afternoon in Stockholm, I would probably have tried layering these pictures digitally; instead, I have tried various ways of combining individual prints to create patterns through repetition. I tried overlapping full-sized (6×4) prints and also cutting them diagonally and horizontally into four and then assembling a single frame from the individual parts. None of these quite worked, so I had some more prints made – this time using Boots’ four-miniature-pictures-in-one-6″-x-4″-print option and cut out one of each. I then positioned them on top of a printed map made from a screenshot of my route on google maps and took my avatar from the top right corner of the browser window, moving it to my set viewpoint. I could further isolate the four central images to make a post-card design, and maybe stick it to a blank postcard, write a message and address on the rear and even post it; on arrival, both sides could be scanned and arranged as a side-by side diptych, but for now, I’ll leave it as a multi-image splat as it catches something of the repetitive nature of my journeys to and from work. Taking photographs of your dinner has become an established ‘thing’ on social media. I quite often take photographs of meals abroad – there are a selection of them in the C&N diary sequences referenced above – but I never really do anything with them. Also – when I can summon up the courage to do so – I’ll ask the waiter or the owner if I can take a photograph of them. They rarely refuse. So, for my third physical work, I had made a relatively simple collage of two photographs taken at the restaurant on my last evening in Stockholm – of my empty plate and of the maître d’ – with a reproduction of the bill which I again distressed a bit for authenticity. They went together quite well, but there seemed to be something missing. I tried replacing the empty plate with the ‘before’ picture; I tried making a composition using both plates, but neither seemed to work. I also had made mini-prints of the before and after plates. I tried adding one of the four miniatures of the ‘before’ plate and realised that the curve of the sausage could be made to align with the name of the restaurant on the receipt. The food on the plate also seemed to form a smiley face – if I was starting a food blog, I could easily use it as my avatar – which then can be seen to mirror the gently smiling face of the maître d’. As the Stuttgart U-Bahn pictures became an arrangement of quadrilaterals, this becomes about circles and the s-curve running from the top right, through the logo on the receipt and then clockwise round the bottom of the larger empty plate on the left. Compositionally, both collages make sense while still allowing the viewer to construct simple narratives from the relationship between their elements. Generally, much more effort is involved in making physical, as opposed to electronic, composite pictures. The basic images need to be resized and printed; cutting out elements and glueing them down is much harder when you can’t simply undo and go back. You build up an image and – if you add one element too many, or want to alter something to fit better a later addition – you have no option other than to go back to the beginning and do a complete remake. The inclination to say ‘enough!’ and stop working (and reworking) further, occurs much sooner. The cost of making multiple prints (even small ones) quickly starts to add up. You think more and act less. You also need space to work. Cutting down fibre board requires a large flat surface; you need somewhere to assemble the collages and to leave them to dry. If you want to photograph them rather than fit them into a scanner – fig.1 was scanned; the other two were photographed – you need space for a lighting set up that will not cause reflections from the surface of. Collages made like this have a physical presence – and depth – existing in three rather than two dimensions. They are objects rather than projections on a screen. I have tried to capture something of this three-dimensional presence with shadows and edges to the individual components of the collages and – in applying a 3:2 aspect ratio to fig.3 – have included a strip to the left of the backing board to emphasise this. These three compositions are photographed objects rather than photographs. Methodologically – building up the image from a number of semi-transparent layers – this draws directly from my research into Corinne Vionnet but the images used here are all my own, made on my last afternoon in Stockholm. The location and central subject are the same as for figs. 3 & 4, but transformed by the winter sun. After taking my final fixed-point picture (181211fuji-655, not used for fig.4) I struck out towards the tower itself (I had time before catching the train to the airport), taking a picture every 200 metres or so, keeping the tower centred and level in the viewfinder. To maintain this framing I had to shift from landscape to portrait as I got closer. Back in London, I played around with layering the series of pictures on top of one another. After they were stacked up, I resized the individual layers so that the size of the tower remained constant across the stack. No blending layer changes were made. I’d started off using all eight of the pictures I’d taken that afternoon, but – to meet the requirements of the assignment – I gradually reduced the number to five. The final images overlaid (at 25% transparency) were 656,657,661 662 and 663. I usually have the radio on while I’m working. As I worked on one of the revisions of this image, I became aware that Richard Long was talking about his walking art on Radio 4. I started listening properly and realised that both this image and 1:2 were related to his practice of setting parameters for walks and then making some sort of more or less transient record of his walking. My intention in making the second of the digitally-created images was to create a coherent piece of understandable narrative within an artificial picture space. I think it works in these terms with a strong sense of left-right movement and it’s structure suggesting a series of windows (the white matte that neatens up the frame, the inner frame showing the train interior with the man and then the train window itself, and the reflections in that window). The image has a sense of physical depth, while remaining stubbornly two dimensional. This image was made by combining four files – three photographs and one scan. Making the final combination was relatively simple – aligning a, c and d and then duplicating the ticket’s layer to allow some of the less important text to be covered up by the dark 20 MIN band. I softened the right hand edge of by blurring the edge of a layer mask. Then I reduced the size of b and superimposed it over the bottom left of a. Finally, I masked off the brown of the airport floor and altered its transparency by experimenting with the blending mode for the visible portions of the layer. After my train arrived at Arlanda airport, I checked in my luggage and went through security. My flight was delayed by about an hour, so I bought myself a beer at an open-plan bar and – like Georges Perec trying to exhaust Place Saint Sulpice in Paris – looked out into the departure space. It seemed to form a natural stage set and – given the strong geometry of the design – probably could form the basis of a large-scale constructed image. People passed through the space in front of me, and I began taking photographs, my camera steadied by my elbows, planted on the high table between me and ‘the stage.’ I tried to get useable groups or individuals in different parts of the frame. Over the course of half an hour, I took around eighty pictures. Most would be unusable, but I knew that some of them included characters who might play well together. Back home, I went through them and narrowed them down to a much smaller group of pictures – eight or so – where someone was caught clearly, doing something in a specific area of the frame. Intrigued (and inspired) by Jeff Wall’s Study for ‘A Sudden Gust of Wind (After Hokusai)’ (linked in the coursebook and referenced below) I made some low-quality, black and white, a4, inkjet prints and chopped them up with a pair of scissors and made a sketch image held together with blu tack. I came up with a composition organised around the looks cast by two figures at either side of the picture – a man seated on the left and a girl wheeling a suitcase on the right with their looks into the frame linked by the manifestation on the glass wall towards the back of the space. Transferring the assembly into photoshop was not too hard and then it was a matter of working to blend the various segments into a seamless whole. These were layered onto a full-width background as blocks based on the ones used for the maquette and then had their edges refined using layer masks. Slight differences in exposure were ironed out using a combination of Levels and Brightness and Contrast layers matched to the visible portion of the image layer they were applied to. Hard edges were removed through a selective use of blurring, again applied to the layer-masks. And at this point, I sought the opinion of the people on OCA-discuss and got a pretty unanimous response in favour of keeping the back ground. The deconstructed version – like a deconstructed apple crumble on Masterchef – pleased no one. It added nothing beyond moving the focus of the narrative onto my work to construct it. The narrative was interesting enough on its own. However, one of my fellow students commented that, ‘They look like they are already on stage and about to begin a drama rehearsal. The kid with the case does not know what the hell is going on – but they are adults after all!! No one is yet centre stage on the yuk yellow/green stage lighting. It’s all about to kick off!! !‘ We had also been talking about music, and so I spent some time playing with the idea of puppets and toy theatres. I made colour prints of a section of the larger picture and assembled them without trying to totally hide the edges; I cut out some other figures and tried positioning them them a few centimetres in front of the newly assembled backdrop. I took some photographs, wondering if I might use the resulting image as a final element of part one of the assignment. Perec, G (1975) [translated Lowenthal, M (2010)] An Attempt at Exhausting a Place in Paris Wakefield Press; Cambridge, MA. While waiting in the queue at Tate Modern to get my copy of Wolfgang Tilmann’s exhibition catalogue 2017 signed, I noticed a book of Joseph Albers’ photo-collages for sale; I flicked through it and, intrigued, later bought a copy online. Unlike the work of John Heartfield or Aleksandr Rodchenko were making at the same time (the 1920s and 1930s) the collages made by Albers were neither political, nor made for public consumption. Rather, they look like quite complex sections of personal albums, made from a mixture of (small) enlargements and strips of contact prints, without much physical work to alter the prints (though the frame of the enlargements has obviously been cropped in many of the instances contained in the book. The effect achieved is one of a more multi-faceted description of people and places than would have resulted from single prints, arranged regularly across the pages of an album. Their subject matter is a combination of portraits of Albers’ Bauhaus colleagues (‘Behind the scenes at the Bauhaus’, perhaps) or visiting, foreign artists (such as El Lessitzky, linking the collages more directly with the work of Soviet artists such as Rodchenko) with pictures taken on holidays and days off (‘On holiday with the Albers?’). They do not appear to have been intended for any wide distribution and act as a side-line to Albers’ work at the Bauhaus, teaching on the architectural and stand-alone applications of making stained glass. Albers’ collages’ purpose seems to be to ‘do something’ with photographs that otherwise would only exist as prints in a box, or a drawer. They present the photographs in a way that allows varying views to combine into something more complicated composite view than would be possible with a single picture, pinned like a butterfly into a formal album. Digital Image and Culture – Simon Chirgwin Blog at WordPress.com.